D40 luminaires ship with hanging yoke, very narrow secondary lens, media holder, and a UL1573 PowerCon power input cable with a connector of your choice. Also, choice of Black, White or Silver body color. The Desire™ Series of luminaires produces such brilliant, high-quality light. And with technology not found in other LED fixtures, you won’t believe how feature-rich and user-friendly they are. Desire D40 color arrays You have even more options when it comes to the D40 color array. The luminaires are available in white, saturated color, or color-spectrum-specific arrays. Vivid™ Desire D40 Vivid luminaires give you the broadest color range for spectrally-balanced saturated and tinted light. Able to match the color from your gelled tungsten sources, Vivid luminaires fit the bill when you need high-brightness light with bold impact. 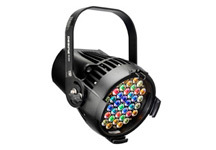 Lustr®+ You get the best all-around theatrical-quality light from the D40 Lustr+ arrays. The x7 Color System is optimized in Lustr+ units to create clean white and tinted light, to bring out the beauty of set pieces, and render individual skin tones naturally.